A Delaware elementary school has issued an apology after parents objected to a fake "hurt feelings" form that was accidentally attached to an email promoting an upcoming event. The one-page form, which originated from Internet humor sites, was accidentally sent out by an unidentified employee of Lombardi Elementary School in Brandywine School District, according to The News Journal. 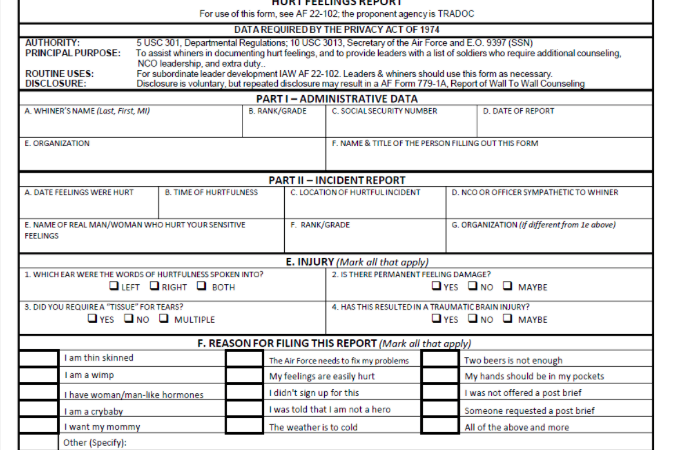 Mirroring bullying reports and other questionnaires, the "Hurt Feelings" form asks "whiners" to fill out information about themselves and the incident in question. In the fourth section of the form, "whiners" are asked to mark all applicable reasons for filing the report, including boxes with phrases such as, "I am a crybaby," "I want my mommy," "two beers is not enough," and "The Dept. needs to fix my problems." A parent who received the email forwarded it to The News Journal, calling it "completely offensive" and adding that it mocked children who are targets of bullying. Alexis Andrianopoulos, a spokeswoman for Brandywine School District, apologized for the error on Wednesday after reiterating that the form was not an official school district document. "This was an embarrassing mistake, but it was just that – a mistake," Andrianopoulos said in an email to The News Journal. "It should not have happened, and we apologize for the error." The Brandywine School District Student Code of Conduct specifically calls bullying "unacceptable" and urges a culture of open communication to prevent harmful behavior. Those who experience or witness bullying – students, teachers and parents – are reminded that they have a responsibility to report such incidents through an anonymous online form reviewed by district's anti-bullying committee.